GAINESVILLE, FL- The Florida Gators celebrated their first home game at the new Exactech Arena with a 102-51 rout of Southeastern Louisiana. Ronni Williams was the story from even before the opening tip, as she was honored for recently surpassing the 1,000 career point mark. Williams opened the first quarter with twenty points, and was only one rebound away from a double-double at halftime. Williams would soon get that rebound and ended the game with a career high 34 points and 12 rebounds. Williams was aggressive early and often and made 14 of her 16 field goal attempts. Williams also stuffed the stat line with 3 assists, 2 steals, 2 blocks, and most important, 0 turnovers. 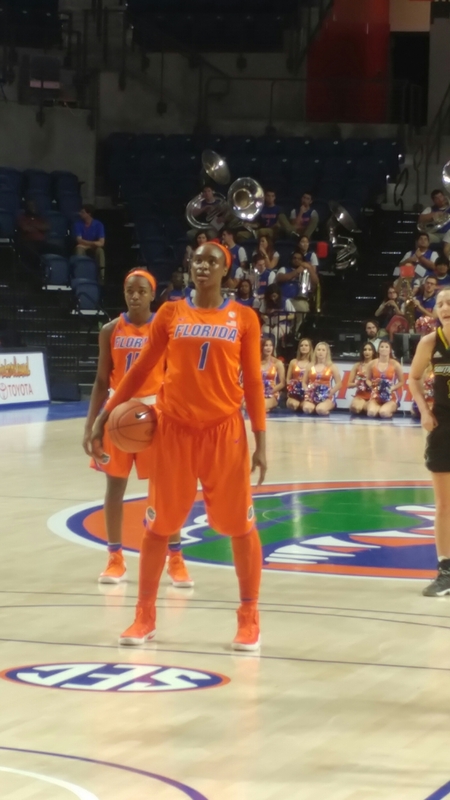 Florida saw all five starters reach double digits in points as Haley Lorenzen (15), Delicia Washington (14), Tyshara Fleming (11), and Deyandria Anderson (11) all joined Williams. Lorenzen also added 10 rebounds. Florida used an eight person rotation and all players played 23 or more minutes. The Lions allowed Florida to shoot at 52% but only 2-14 from behind the 3-point line. Florida outrebounded the mush smaller SE Louisiana 47-29. Florida improves to 9-4 on the season, and will begin SEC play on Sunday against Auburn in Gainesville.